The driver is accused of sexually assaulting a number of women while he worked for ride-hailing services in San Diego. At least one more potential victim of a San Marcos man accused of sexually assaulting women while he worked for a ride-hailing service has come forward. Jeremy Vague, 37, a former driver with Uber and Lyft in San Diego, is facing four felony counts in the sexual assault and sexual battery of three women. Escondido police believe there may be additional victims. Police announced Vague's arrest Wednesday, and received calls from two additional victims in the following 24 hours. One adult woman called on behalf of her friend, who she believes was assaulted by Vague. Police are in the process of interviewing her. The other potential victim may be a juvenile, police said. Authorities say on Sept. 16, at approximately 1:15 p.m., an 18-year-old student at Palomar College San Marcos campus requested a ride to an Escondido home through Uber. 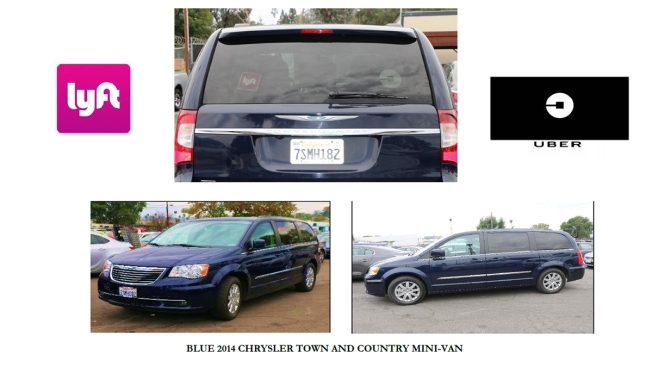 The driver, identified as Vague, arrived in a blue, 2014 Chrysler minivan 7SMH182, according to Escondido Police spokesperson Justin Murphy. Instead of taking the victim home, Vague intentionally turned off the Uber app and veered away from the route to an area where he sexually assaulted the victim, Murphy said. After the assault, the suspect drove the rider home and dropped her off. Wednesday night, Palomar College sent out an e-mail alert to students advising them of what happened. Students at the school said the news is upsetting. "I know a girl today who took an Uber to class, and I told her to be very careful because of the news," said Ivette Patricio, a student. "It's scary because it's our lives at stake, we're coming here to get an education and the last thing we should be worrying about is getting assaulted in any way." Vague was arrested on Friday and is being held without bail. On Tuesday, Sept. 6, the same suspect allegedly attempted to lure another Palomar College student into his van during school hours. The woman did not feel comfortable and did not request a ride-hailing service. During the evening on Wednesday, Sept. 7, the same suspect gave a woman a ride through the Lyft service. Vague is accused of sexually battering the 19-year-old rider and another 19-year-old female who was waiting for her. Escondido Police say investigators were not aware of the initial report until after the Sept. 16 investigation began. Police said Vague's employment at Lyft and Uber has been suspended pending the investigation. The Escondido Police Department is asking anyone who may recognize Vague or the circumstances to reach out to their investigators. Anyone with information regarding this investigation can call Detective Damian Jackson at (760) 839-4932.